Fight or flight. Which response would you choose if you’re faced with one of your worst fears? If you often go for the former, then you might want to look into these Peril Sensitivity glasses. As the name implies, these glasses are “sensitive” to things that stress you out or cause anxiety. 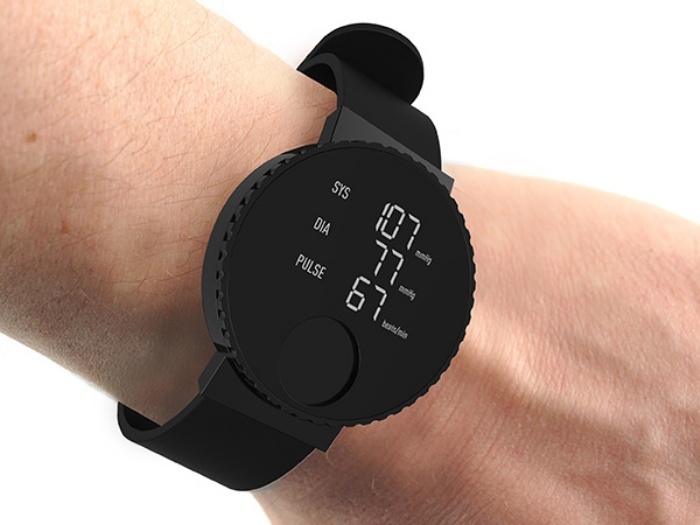 It determines this by checking your vital stats, care of the temperature sensor, pulse sensor, ambient light sensor, sound detector sensor, and accelerometer crammed into the device. Once your anxiety level is up, the glasses shut down and black out your vision by making the glasses opaque. 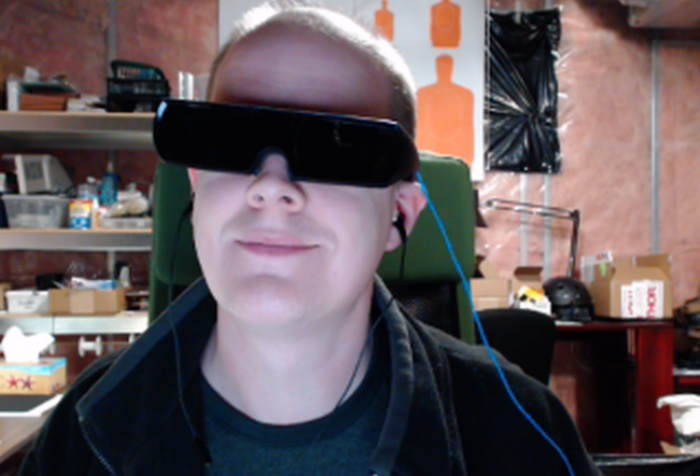 In short, these glasses let you block out the problem by blacking it out. Out of sight, out of mind–do you agree? High altitudes do weird things to the human body, even if it might be one that belongs to a seasoned trekker. Dizziness, nausea, fatigue, headaches–these are pains you wouldn’t want to have to go through in the middle of a climb. That’s what the folks from the Kokopelli Backpackers hostel had in mind when they rolled out their edible business cards that double as anti-altitude sickness remedies. First of all, it’s a business card, so all the hostel’s pertinent contact information are printed on it. 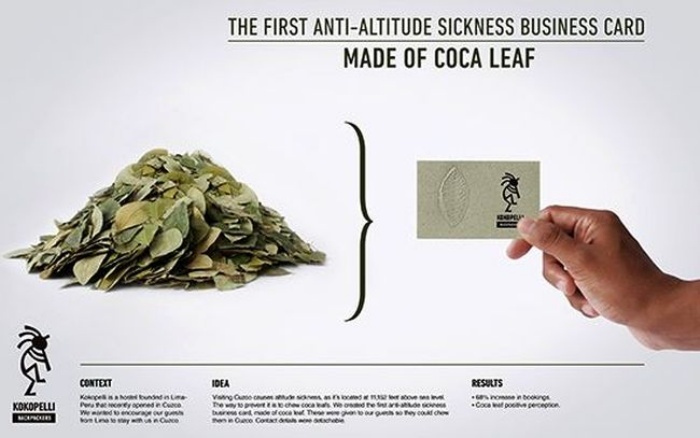 Then comes the interesting part: each card has a detachable, edible section made from coca leaves that gives climbers an extra boost as they chew on it. 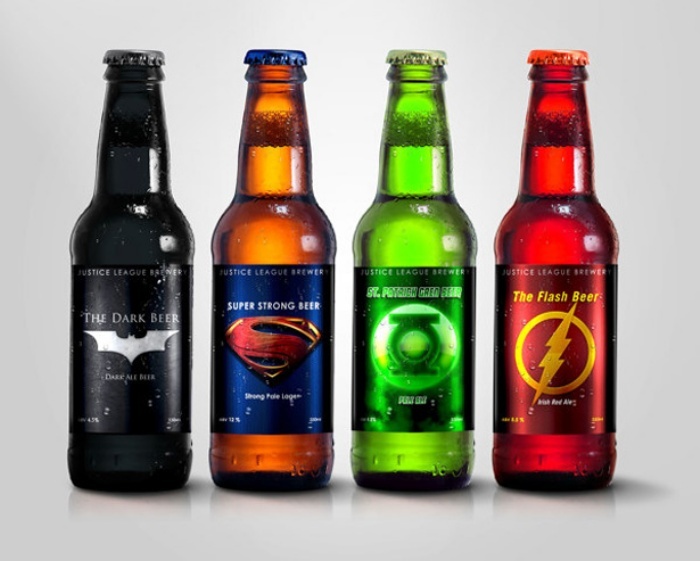 Ever wondered what superheroes did to unwind? They probably went out on trips or pretended to be mere civilians for a change. 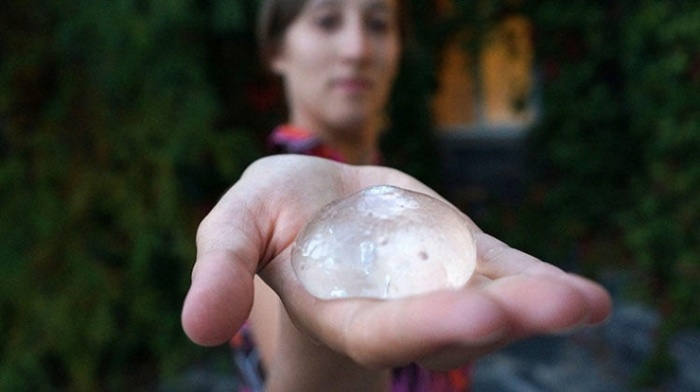 Or they could be huge beer fans and brew booze whenever they get the chance…or not. The road to the perfect proposal is a tough one. But before you drop down to one knee, there’s the matter of getting the ring made. 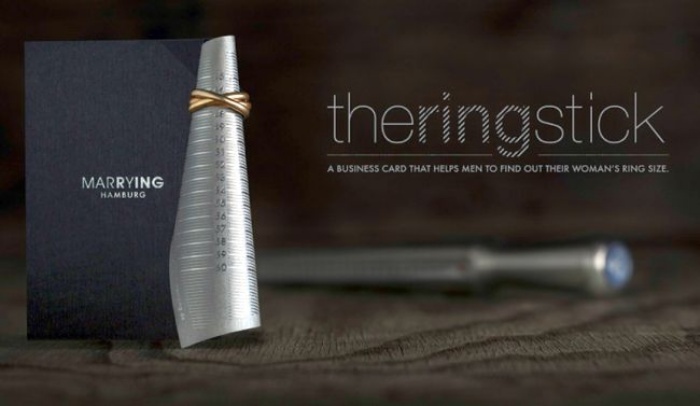 Obviously asking for your significant other’s ring size gives everything away, so German ring maker Marrying and ad agency Jung von Matt/Alster teamed up to created the Ring Stick. By Hazel Chua on 02/27/14 • Leave a comment! There are many reasons why most people prefer folding, automatic umbrellas. For one, they’re more compact and expand with a simple push of a button. They’re less of a pain to carry around and you don’t have to deal with one problem that people with regular umbrellas have: trying to make it stand when it’s prompted against a wall or table. Solving this first-world problem are Liang-Hock Poh and Ming-Hung Lin, who came up with the Flexibler. 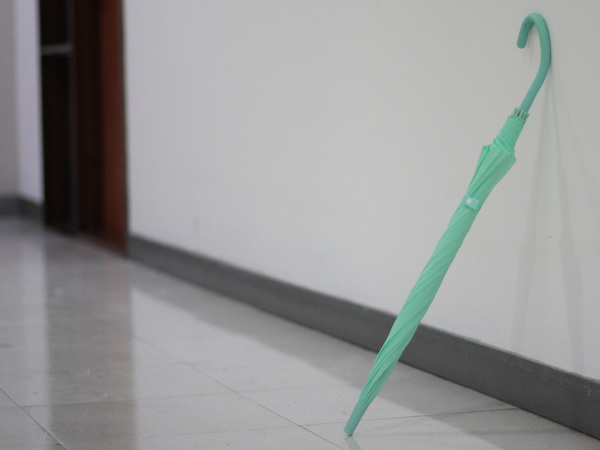 It’s basically an umbrella with a flexible, adjustable handle that you can bend and twist this way and that to stabilize it when you want to make it stand. Back in the day, our ancestors used to communicate to one another using nothing but smoke signals. Now you can do as what they did in the past (with slight modifications) with the SMS case, with SMS standing for “smoke messaging service.” It’s a case designed by Dennis de Bel which hides a chamber filled with lamp oil inside. 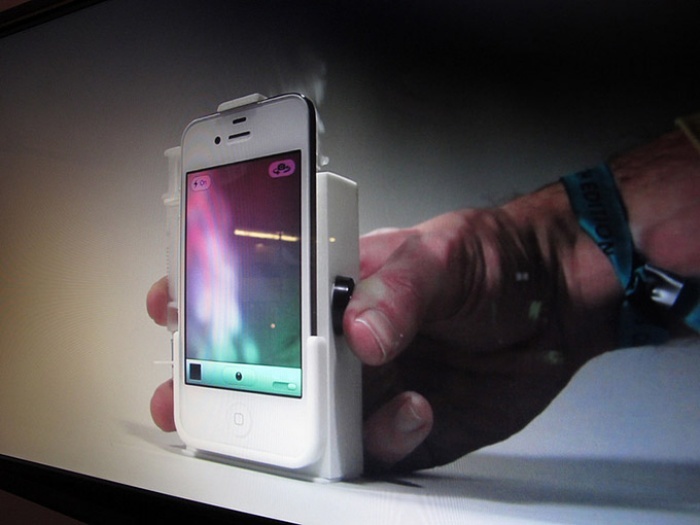 When the button on the side is pressed, the case heats the lamp oil up to produce wispy clouds of smoke. Of course, in order to respond via smoke as well, others will also have to have an SMS case or another contraption that can produce smoke. Seems a little backward in this day and age of instant communication, so maybe that’s one point Dennis wanted to touch on with his project. By Hazel Chua on 02/18/14 • Leave a comment! You’ll never forget to take another dosage of your meds with the Pill Watch strapped on your wrist. It’s a one-of-a-kind timepiece that has a small, built-in compartment where you can store one of your pills for back-up, just in case you accidentally left your pill box at home and need to take your meds. It’s a watch, first and foremost, so the face displays the current time. 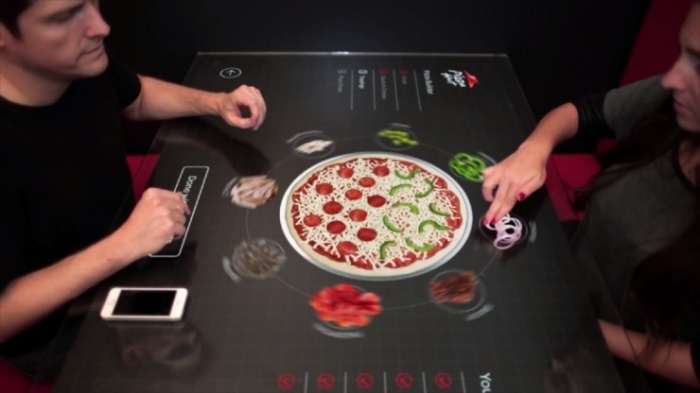 It also comes with a pulse measuring feature that might come in handy. When you’re ready to access the pill, just turn the face to reveal the compartment.